Haiku is great, but a single-user OS is a security nightmare these days. I really hope the devs can get something going on the security front. I think it’s is going to be added in R2. R1 is designed to backwards compatible with the last release of BeOS, and introducing multi user support would doubtlessly break a lot of stuff. Back in the days, PhosphorOS introduced basic multi user support. Also an (officially unreleased) ZETA 1.51 also supported multi-user support. I cannot recall experiencing incompatibilities with these implementations. Was it ctri+alt+delete? That sounds like a Windows shortcut. BeOS never had an inbuilt task manager. Dano (Dan0 doesn’t exist, Dano0 does, Dano was the designation, Dano0 was part of the build name, as was Maui0 for R5 and Genki0 for R4.5) source was leaked. Yellow tab had it. This is all pretty clear. Actually, the ALT-CTRL-DEL is a BIOS shortkey to reboot. However, most operating systems override this shortcut. When the Tracker process wasn’t running, it would show an extra button “Restart Desktop”, which was the PhosphurOS exploit to gain access without password. 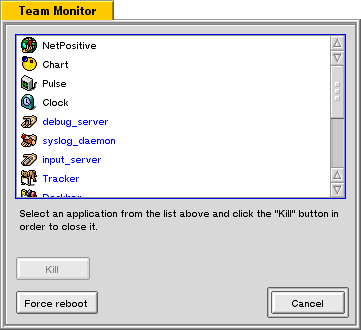 In BeOS, ctrl+alt+delete would indeed bring up a modal window showing running teams (with the option to kill them), as well as the option to restart the desktop (aka Tracker) if it wasn’t running. Techinically the multiuser approach to Zeta 1.5 was full of holes. Just some simlinks and access checks. Could you please explain how a single user OS is a security nightmare these days? Because if any user is root, then any user can give any other user access to everything on the system without as much as an exploit. Completely by accident. The multi-user concept is not the only way to provide security. An operating system is not inherently insecure because it does not provide multi-user support. Here is an hypothetical operating system: It does not have a multi-user implementation. However, privileged operations can only be performed by passing security mechanisms like fingerprint or retina scans. Does that make it more insecure than a multi-user operating system? Computer security is a complex thing and there is no -one way- of dealing with it. In a typical Ubuntu installation, you are the only user and can pass your credentials to the apps that need higher privileges. A monouser OS with such behavior is equally secure than a multiuser OS. In any Ubuntu installation, there are several users like root (yes, despite it not having its own login), dbus and nobody in addition to the end user’s own account. A single user system, by definition, does not have that kind of privilege separation. Oh I get it, it’s “check your root privileges” all over again. Because if any user is root, then any user can give any other user access to everything on the system without as much as an exploit. You don’t need a multi-user scenario to prevent things like that, you need something like sudo/UAC, a special passworded command that allows you to do things which can affect the actual system. It is the risks associated with running everything with the same privileges. And having no per user structure to keep files and preferences separate. I am really looking forwards to the next Haiku alpha / beta but compared other operating systems there are important missing features. Haiku is great, but a single-user OS is a security nightmare these days. Haiku is firmly focused on the end user desktop, I don’t know about you but I’ve never seen the need to have separate accounts on our machines here at home. this is indeed an important step for haiku. And I couldnt imagine that it would come so soon. I guess next year on about the same time, haiku will finally enter the beta phase. How will be 32bit programs supported on it? Like on Windows and Linux with twice existing libaries (all in 32bit and 64bit)? x86-64bit-Linux have in /lib and /usr/lib the 32bit libaries and in /lib64 and /usr/lib64 the 64bit libraries. 64bit Windows doing it similar. In C:\Windows\System32 are 64bit libraries and programs. And in C:\Windows\SysWOW64 are the same libaries and programs in 32bit. Yes, there are also notepad.exe, calc.exe, etc twice. And for the installed programs existing different places, too. In “C:\Program Files” are the 64bit programs and in “C:\Program Files (x86)” are the 32bit programs. Will be 32bit programs on 64bit Haiku supported? If yes: Will be all libraries exiting twice? doesn’t Haiku already do this for the Hybrid? So, let’s assume 64bit would be entirely Gcc4 (because, why wouldn’t it?) does that mean 3 sets of libraries? Gcc2.x 32bit, gcc4.x 32bit, gcc4.x 64bit??? This seems quite an excessive amount of binaries! But I’m guessing it would be needed to support all 3 architectures. x86_64 is gcc4 only, gcc2 is for x86 only. …does that mean 3 sets of libraries? Yes, each application needs to be packaged into 3 binaries, one for x86 gcc2, one for x86 gcc4, and a third for x86_64. Right now it is difficult enough to maintain separate x86 gcc2 and gcc4 packages, x86_64 will add a 3rd. This is a good opportunity for the package manager and IDEs to make this easier by automatically generating “Fat” binaries that run on all architectures. However, this is a problem that must not be solved immediately because the official Haiku R1 release will be x86 gcc2h (32-bit). Official x86_64 support will come in R2.